Meiji Shrine is the Shinto shrine that is dedicated to the deified spirits of Emperor Meiji and his wife, Empress Shoken. Emperor Meiji was the first ruler of modern Japan, and helped end Japan’s feudal era, which ushered in the westernization and modernization of Japan. The shrine has the largest number of visitors in Japan during the New Year period, regularly exceeds 3 million people over a 4 to 5 day period. When a sumo wrestler achieves the status of Yokozuna, or the highest-ranking type of Sumo wrestler, they hold the ceremony of entering the ring at the Shrine. It is also a popular place for holding wedding ceremonies. 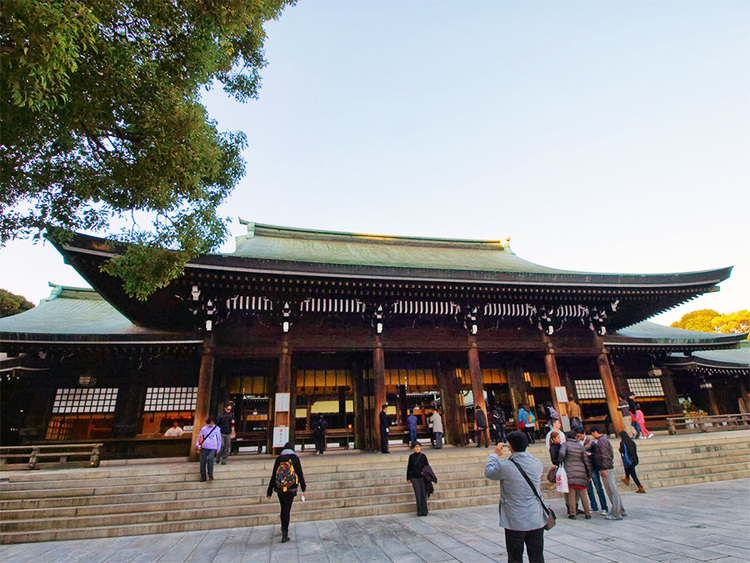 Meiji Shrine is located next to Harajuku Station on the Yamanote Line, and the inner precinct covers an area of 700,000 square meters, or about 175 acres. This area is covered by an evergreen forest that consists of 120,000 trees of 365 different species, all of which were donated by people from all over Japan when the Shrine was established in the 1920’s. After the death of Emperor Meiji in 1912, the Japanese government decided to commemorate the Emperor’s role in the Meiji Restoration. 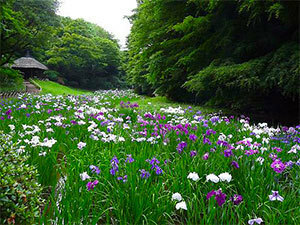 An iris garden which Emperor Meiji and Empress Shoken had been known to visit was chosen as the Shrine’s location. It was formally dedicated in 1920, completed in 1921, and its grounds officially finished in 1926. 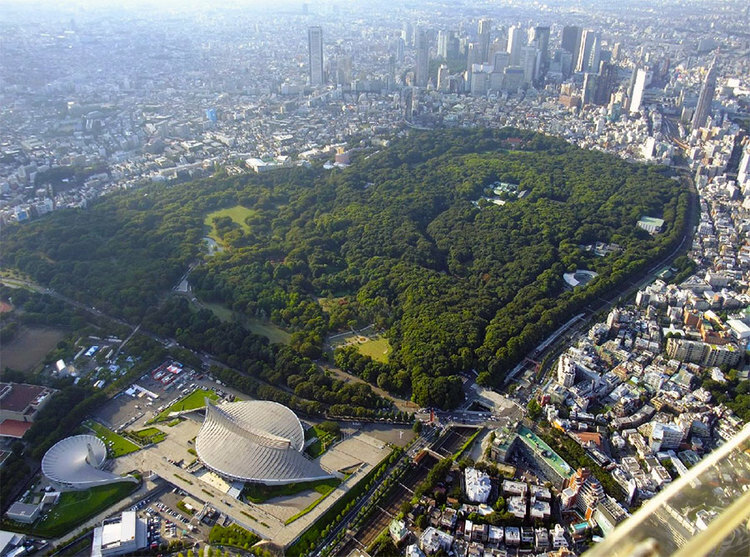 The original building was destroyed during the Tokyo Air Raids of World War II. The present iteration of the shrine was funded through a public fund raising effort and completed in 1958. 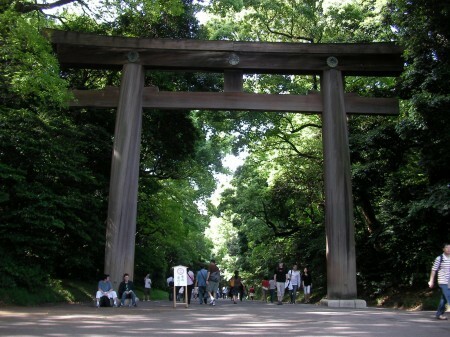 O-torii, meaning huge Shinto archway, is a symbol of Meiji Shrine. It is 12 meters tall, made of wood which was imported from Taiwan. In fact, what you see is not the original Torii gate, because the original was destroyed in a thunderstorm in 1966. It was replaced by new one, with the wood again coming from Taiwan. Sake barrels that are usually dedicated by donators to shrine can be seen in the walkway toward the main hall of Meiji Shrine. You can also encounter the rare scene of wine barrels dedicated, and decorated in Meiji Shrine, as Emperor Meiji was said to have been a wine lover. The Meiji Shrine Gardens, or Imperial Gardens, is the only part of the inner precinct that had existed long before the establishment of the Meiji Shrine. 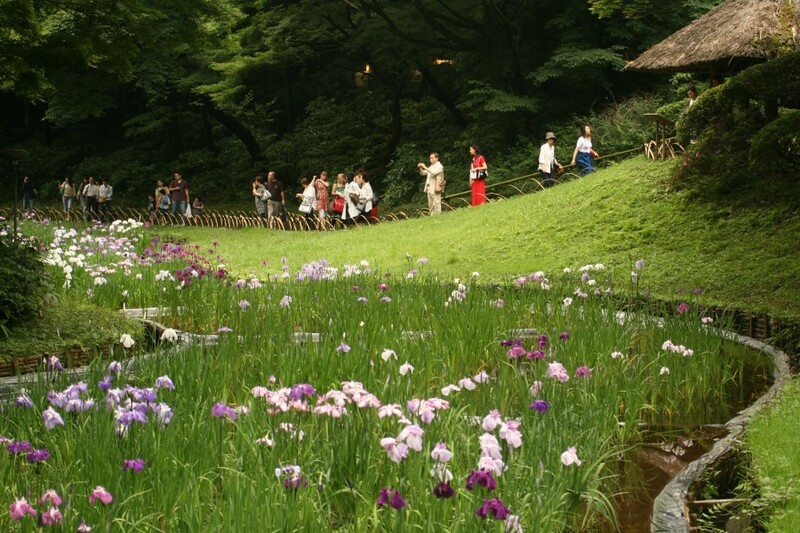 In fact, Emperor Meiji designed the iris garden, small paths and a fishing spot originally located in the area specifically for Empress Shoken, in order to give her fresh energy. Fresh verdure in spring, various kinds of flowers in the summer, autumn leaves, and snow in winter give inexhaustible charms to the garden all year round. 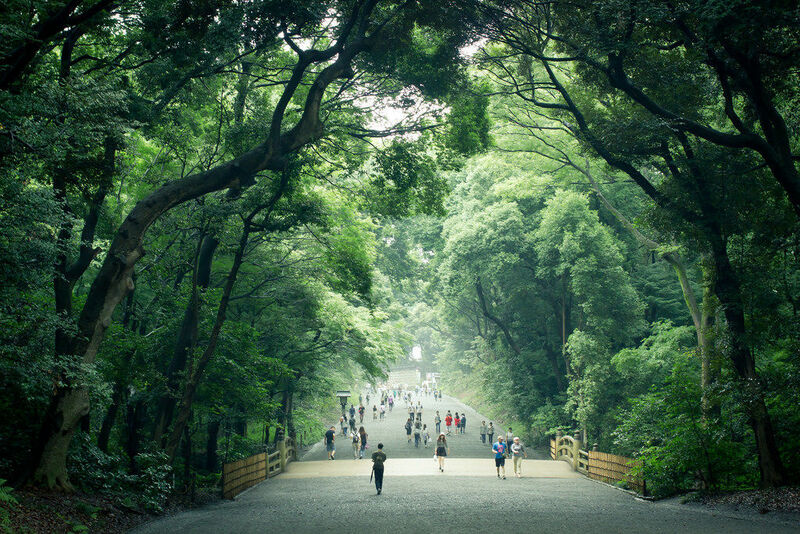 The Meiji Shrine Forest was created in honor of Emperor Meiji and Empress Shoken, for their souls to dwell in, and every tree was tenderly planted by hand. 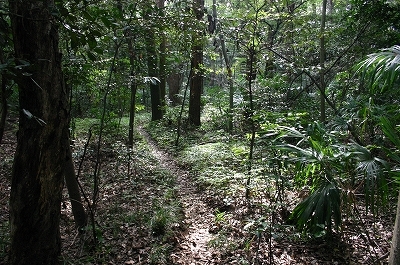 This Forest was carefully planned as an eternal forest that was created in the Taisho era, which was from 1912 to 1926. After over 90 years, the Forest cannot be distinguished from a natural, wild forest, being inhabited by many endangered plants and animals. Here’s a festival for anyone who has ever wondered what happens to soft toys and beloved dolls after they’ve rendered years of devotion to children. This particular festival takes place every year at the Meiji Shrine. 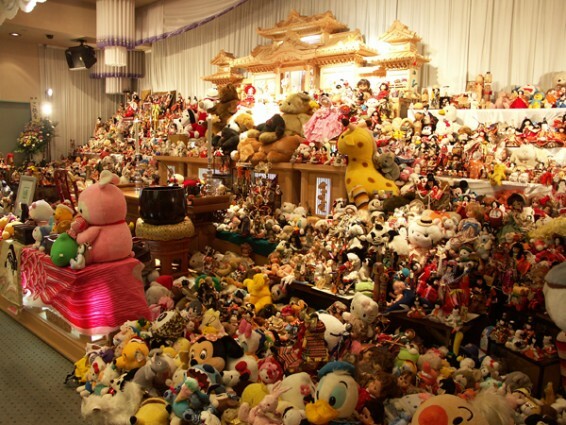 All kinds of dolls and soft toys are collected from children’s families after they are no longer needed, displayed for a while, given thanks for their years of loyalty and then sent off to the spirit world. For a price tag of ¥3000 per bagful, you can bring your own devoted companions to hand them over to another world. You can also view a dance performance in honor of the dolls.